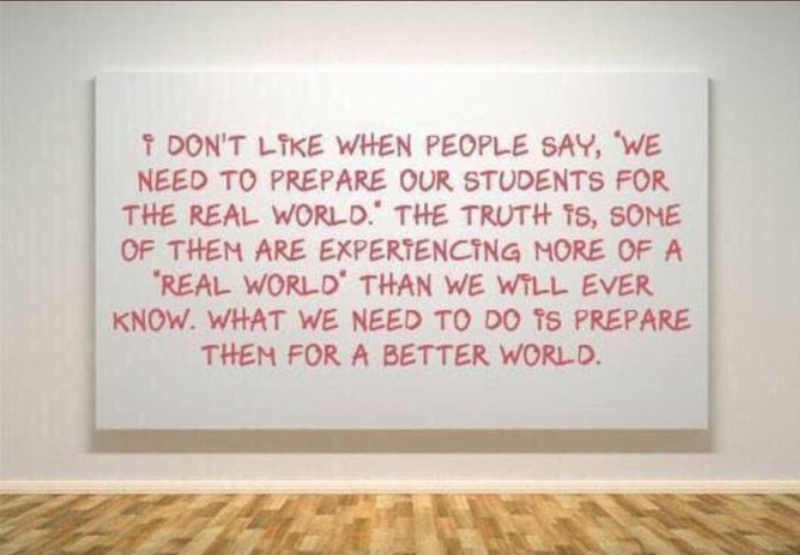 “I don’t like when people say, “We need to prepare our students for the ‘real world.’ The truth is, some of them are experiencing more of a ‘real world’ than we will ever know. What we need to do is prepare them for a better world.” That is the thought that popped in my head, and that’s the phrase I posted on Twitter one day. The students I work with on a daily basis have some tough lives. The stories I hear from these students about the things they are going through outside of school are enough to break your heart a dozen times over. It’s a miracle to me some days how these students can function and stay engaged at school when their minds are thinking about other things, like where am I going to stay tonight, or will there be any food left for me, or can I fall asleep tonight and feel safe? So these students...your students...are dealing with a reality right now that we can’t prepare them for, because they are already living it. What we need to do, in my opinion, is give them something to hope for, to strive for, to believe in. We need to help them feel a sense of belonging in this crazy, mixed up world of theirs. Real belonging, where people love and care for one another and feel safe. We have the opportunity each day at school to look these students in the eyes, to notice them, to let them know someone in this ‘real world’ believes there can be something better for them, and we will help them each step of the way while they are in our care, and beyond. So I posted the thought on Twitter. And it got some likes, and some retweets. Thousands of retweets, in fact. Different people picked it up and claimed it as their own. Some publications even grabbed it and tied their name to it. People commented on it, some positively, some negatively, and some added their own version. It still pops up in my Twitter feed every once in awhile as I’m scrolling through on my phone. And it makes me smile, because it has become bigger than myself. It has got some people talking, and thinking, and sharing. So if that thought helps one person take pause and reflect on their own relationships with their students, and change the way they work with them in a more positive way, then I believe the ‘better world’ is already taking place.